The Levitation® 2 Knee Brace’s powerful bionic assist helps you lift safely, so you can push yourself harder than ever. Achieve your training goals with more stability and power. The revolutionary bionic technology in Levitation brace helps you achieve your training goals, even when you skip leg day. But don’t skip leg day. Don’t let your knees let you down when you’re deadlifting. You push yourself to new levels of achievement, but sometimes you might push too far. Our bionic knee brace helps reduce joint compression in your knee, meaning you’ll see fewer joint overuse injuries and less meniscus damage. Levitation also prevents your knee from giving out, so you can more safely increase your weight. Weight-lifting prevents injury by strengthening the muscles surrounding your knees, which takes stress off the joint. Regular strength training can also prevent injury by increasing your bone, ligament (connects bone to bone), and tendon (connects muscle to bone) density over time. You’ll also be at lower risk for developing chronic conditions like osteoarthritis. During training, our revolutionary technology absorbs kinetic energy when you bend your knees and releases the energy when you straighten your knees. 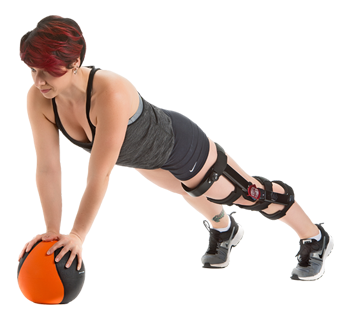 The fully-customizable force output lets you control how much help the brace gives you. As you get stronger, you can gradually dial back the assist.